The importance of future generations in Northern Ireland learning languages to keep up with an increasingly globalised society was a key theme of a conference held at the University of Ulster this week. The purpose of the conference was to outline the key proposals of the Northern Ireland Languages Strategy, Languages for the Future, with a view to encouraging the development of language teaching and learning in Northern Ireland. Education Minister John O’Dowd attended the event and was welcomed to the campus by Professor Alastair Adair Provost of the Belfast campus and PVC for Development. Professor Adair underlined the commitment of the University of Ulster to the learning and teaching of languages, in particular, the recent establishment of the Confucius Institute at the University. Minister O’Dowd said: “I believe that developing languages skills can help our young people become creative, confident and articulate individuals, able to play their full part in society and achieve their full potential. Professor David Johnston (QUB) and Professor Ailbhe Ã“ CorrÃ¡in from the University of Ulster were co-authors of the Strategy. The Languages Strategy for Northern Ireland was created against a background of profound change. Globalisation, the continuing development of the European Union, the growth of low cost air travel and demographic change are factors that are already affecting Northern Ireland’s society and its economy and will continue to do so for the foreseeable future. The Strategy team focused on three areas: education (Languages for Life), business (Languages for Prosperity) and social life (Languages for Understanding). It was developed over a number of years by an extensive process of consultation with the public, key interest groups, language experts and stakeholders both on-line and at a series of targeted events held throughout the Northern Ireland. 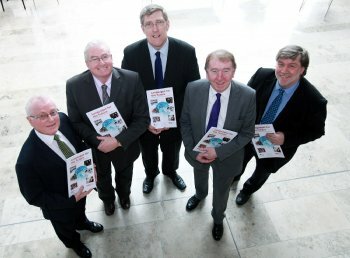 Caption: (left to right) University of Ulster’s Professor Alistair Adair and Professor Ailbhe Ã“ CorrÃ¡in, Education Minister John O’Dowd, Professor John Gillespie and Professor David Johnston from Queen’s University.